China's People's Liberation Army (PLA) has announced major changes aimed to transform itself into a modern fighting force taking its focus away from land-based fighting which has defined much of the 20th century since WWII whiling boosting its navy, air force and new strategic units focused on emerging hi-tech threats such as cyberwarfare. A new report this week in the official Xinhua News Agency has touted the military's "transformational changes" which has seen its infantry and ground operations branch outpaced by the others as part of what's described as a "strategic shift designed to transform the People’s Liberation Army into a comprehensive modern force." The shift is so significant that it's seen the navy, air force, rocket force and a "strategic support force" (responsible for areas like cyberwarefare) climb to over the 50% of total PLA troops, further leaving the total number of officers in the PLA reduced by 30% (as traditionally large ground forces require more officers for those units). Calling the shift "unprecedented," Xinhua described the reorientation in the PLA's priorities a result of President Xi Jinping's 2015 pledge to downsize the number of personnel by 300,000 in order to rapidly bring the armed forces into the modern era, which has largely left massive infantries and "front" warfare behind. 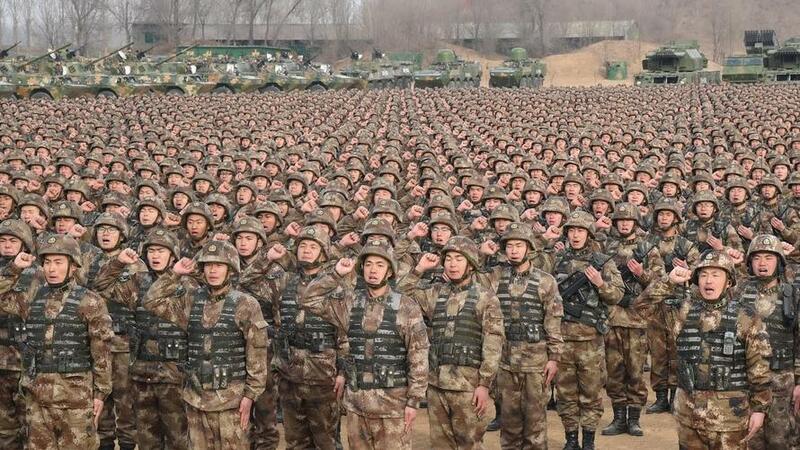 But regardless of the huge reduction China still has by far the largest military in the world by sheer numbers, with 2 million active servicemen and women, down from 2013, when a defense white paper puts its combined branches at 2.3 million servicemen, with only 235,000 in the Navy and 398,000 in the Air Force. By comparison, the United States claims nearly 1.3 million total active military personnel and another 800,000 in reserves. With China's army now taking a backseat, Beijing is expected to continue shifting away from mere homeland-based defense to engaging threats by air and sea, increasingly in disputed waters in places like the East and South China China, and in protection of its interests abroad as its "Belt and Road Initiative" continues to take root. In announcing the strategic shift, state media cited a Shanghai-based military analyst, Ni Lexiong, to say that Beijing is responding to the rapidly transforming battlefield: “The Chinese military used to… operate following the model established in the second world war,” he said. “It had to be reformed and optimized to meet the pressing needs of the changing times and this is the purpose of the overhaul,” continued Ni. This includes, he explained, the necessity of reducing the redundancy which comes with an oversized infantry and ground operations force: “In the old set-up, the PLA had too many officers. In this overhaul, all these officers must find new positions and adapt or they will be made redundant,” said Ni. The leaner force aims to prioritize advanced defense technology to bring the PLA up to par with global rivals, such as the United States, which by all accounts has established global military superiority though never having the largest forced based on sheer numbers.